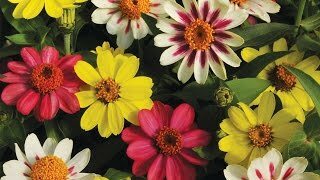 Produces a jubilant crowd of daisy-like double flowers. Layers of soft pink petals surround a white aureole and sunny yellow button center. Strong stemmed, heat-tolerant 15–18" plants produce a continuing profusion of long-lasting, cut-ready blooms. Picturesque in the border or a container. Sow indoors 8 weeks before the last frost. After all danger of frost, select a location in full sun with good rich moist organic, slightly acidic, well-drained soil. Space plants 18 inches apart. After new growth appears, a light fertilizer may be applied. Keep granular fertilizers away from the plant crown and foliage to avoid burn injury. In general gerberas may be fed about twice a month. Gerberas are ideal as cut flowers. They may be grown as a house plant.